Hope, triumph, and the miracle of a mountain! Finally, after what has turned out be a very busy first half of the week, I am back to finish this post I started days ago! On Sunday, at some crazy ridiculous minute past five in the morning, my alarm went off to remind me it was time to get up and head to the mountain. 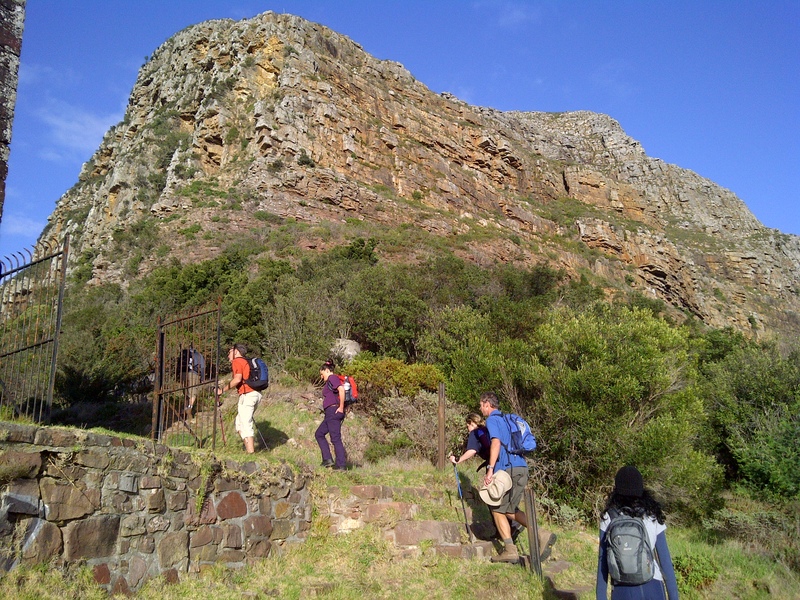 By 7:30am we had all gathered at Rhodes Memorial parking lot where our hike would begin. 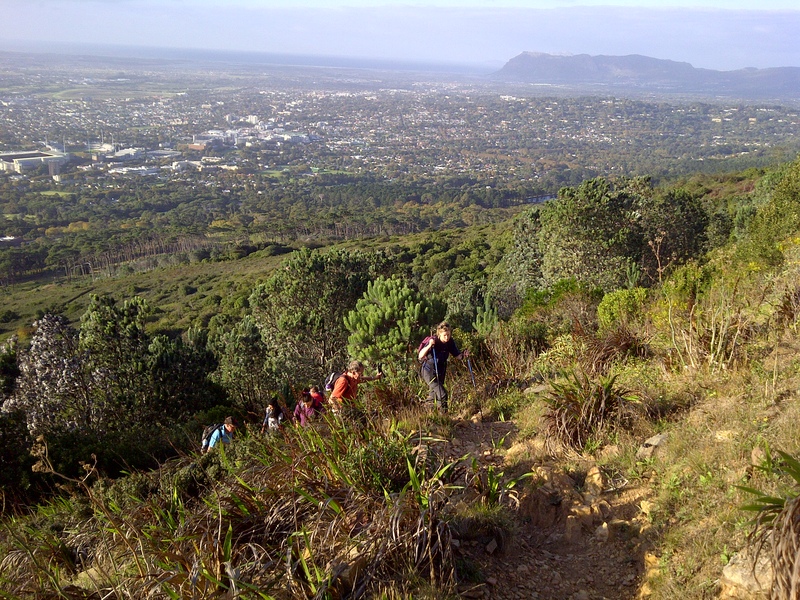 It was a nice crowd, with about 15 of us ready to tackle the route up to Devils Peak. I had done this hike before except from the other side of the mountain and I was looking forward to ascending from another route. It was a beautiful cool autumn morning and although there were a few clouds scattered across the blue sky, the sun was due to shine. 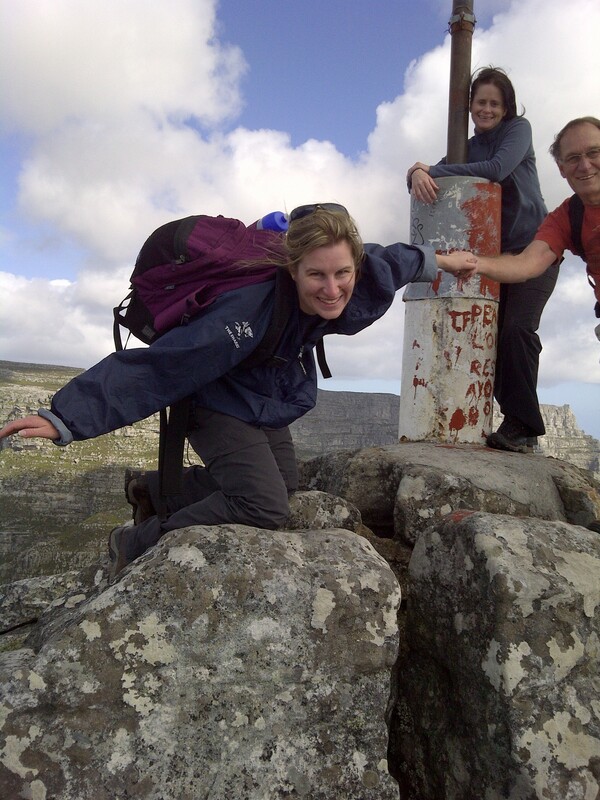 David and Pierre were both there again, Donna and I had met them two weeks ago on the hike up Skeleton Gorge. They are two delightful, entertaining gentlemen who have been friends for years. 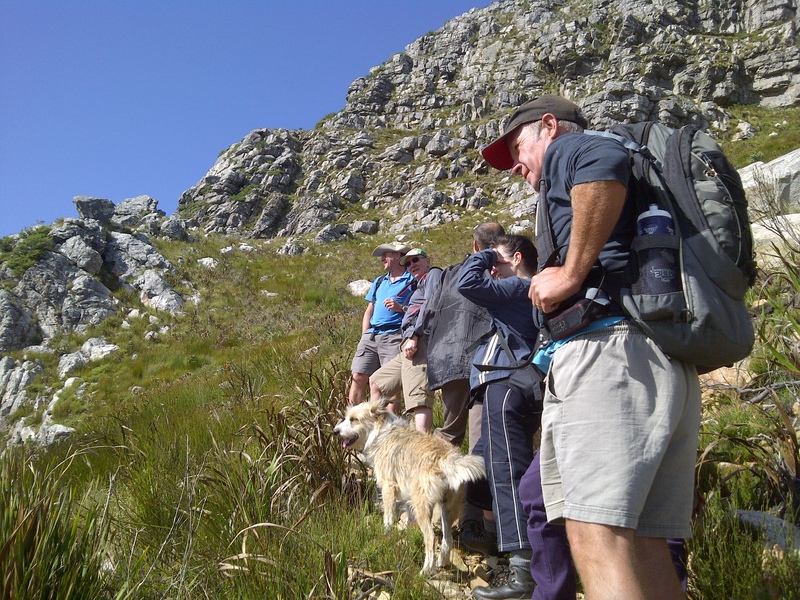 We have all affectionately given Pierre the name PierreFM because from the start of the hike right to the end, he entertains us with one story or another and even when others have grown quiet you can still hear Pierre telling some story and usually Donna is right there with him! Upon leaving the parking lot, we started heading up between the pine trees, warming up quickly as the climb began! Steps, my favourite! (She says dripping with sarcasm!) Now these are not steps you find in your home or office building, these are huge big gigantic steps made of out the mountain earth. I, along with many others, have come to hate steps on a hike. I blame the Otter Trail entirely! Just when you think you at the top of the section you on, you look up and there are about another 100 steps to go before you come anywhere near a rest! All I can say is thank goodness I have long legs! The groans down the line of people walking up them always make me laugh and please don’t even try to hold a conversation with me I tackle the mountain stairways ~ I’m trying to perfect the art of “panting & puffing” let alone the art of holding a conversation! Give me a steep, upward path with rocks and sand and I’m happy but I don’t know what it is about steps on a mountain but they have over the years become my nemesis! After the first section up the mountain side, we stopped at the top to let the group all catch up. We took in the views that already lay before us and once the group was all together it was forward march. By the time we reached the top of the 2nd lot of stairs, each person that arrived would take off their backpack and the layers of cloths started coming off. Although a cold wind was blowing, the sun on our skin was warm and the blood was pumping through our veins and we had by far warmed up enough! A short walk further we reached the Kings Block House, which is a historical site on Devils Peak. The Block House (basically a fort) was built at this point in 1796 by the British as a defensive and lookout position. 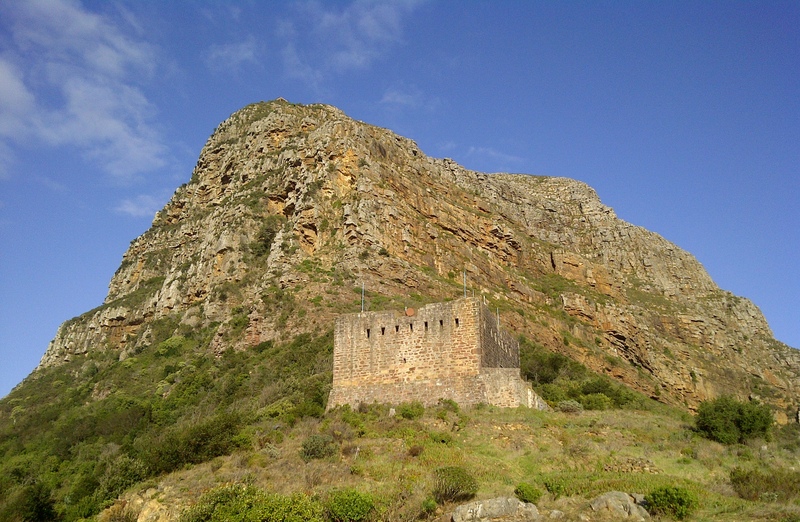 Because of its location the Block House is able to see False Bay and was able to send signals to the Castle down in the city centre below. From King’s Blockhouse, looking up we were able to see a small stone building atop the ridge in front of us. 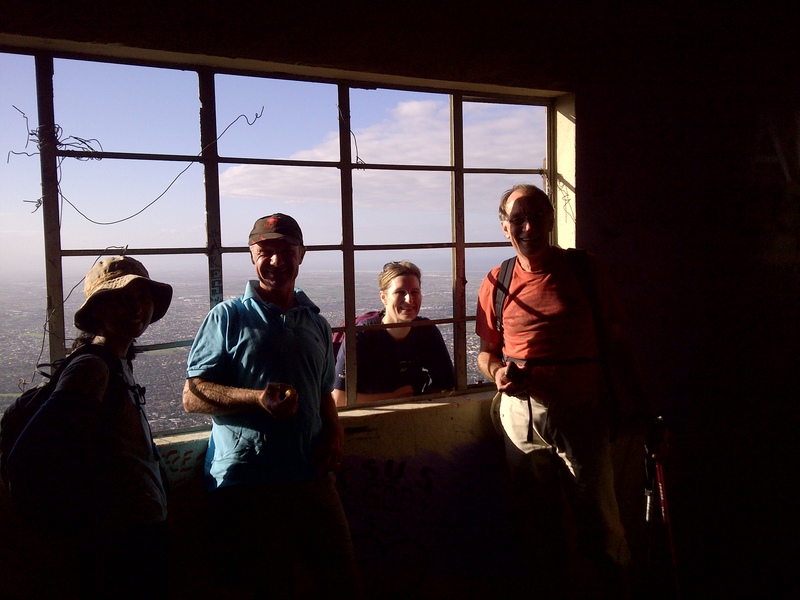 This was the Mowbray Ridge and the building is apparently an old fire lookout and this is where we were heading before moving on to the summit of Devil’s Peak. 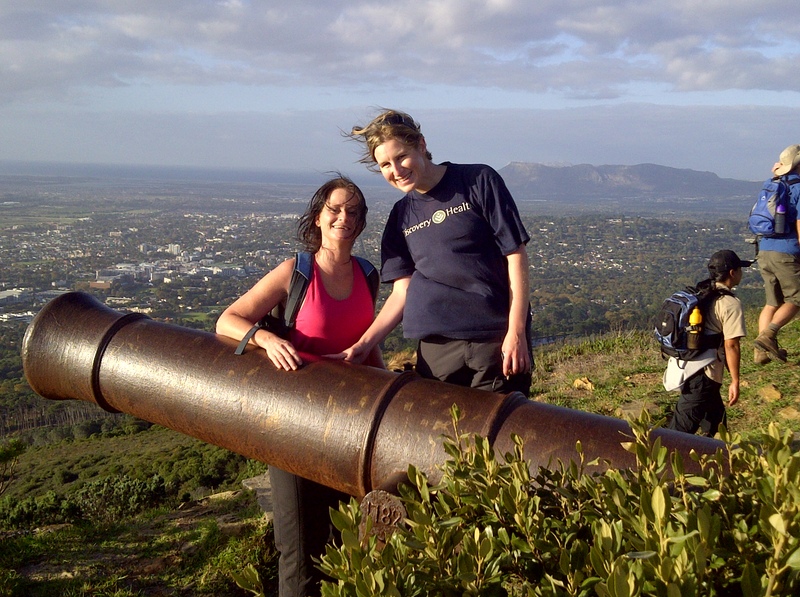 After taking a short break and snapping some photo’s we headed on and up. This is where the hike started to get interesting to say the least! 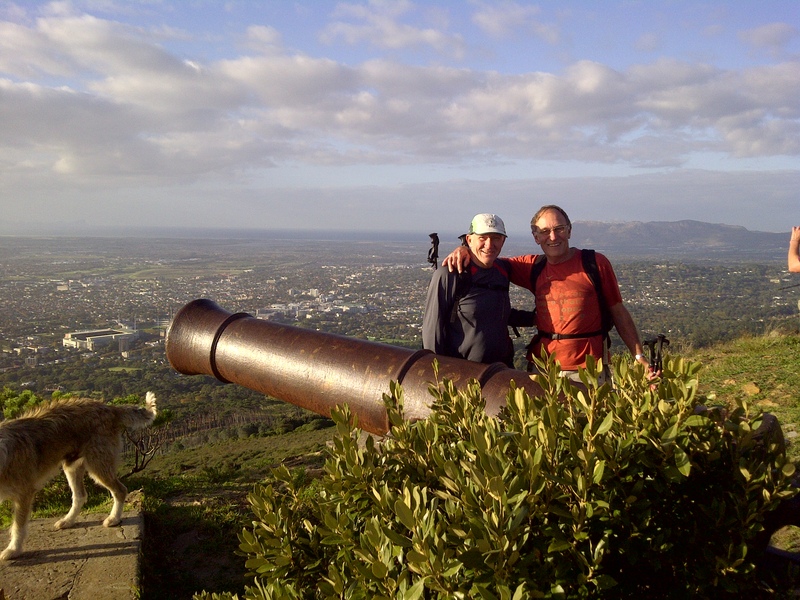 Donna and I at one of the canon's at the Kings Block House. David & Pierre at the canon at Kings Block House. The Kings Block House, which was built at this point in 1796 by the British as a defensive and lookout position. If you look to the top of the mountain behind the Block House you will just be able to make out the old fire lookout ~ that was to be our next stop! 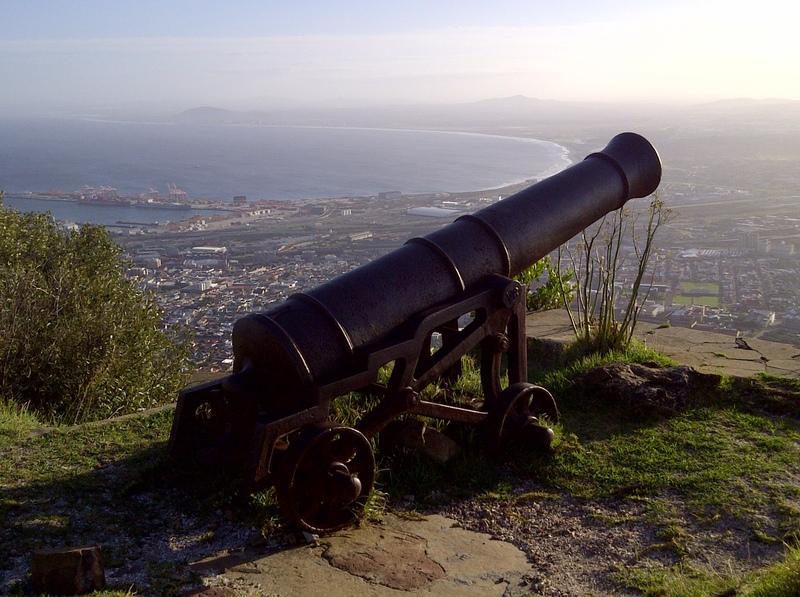 One of the two canons at the Block House overlooking the city below. Leaving the Kings Block House we began heading up ~ this is where our climb up really began. Behind the blockhouse the climb started in earnest. 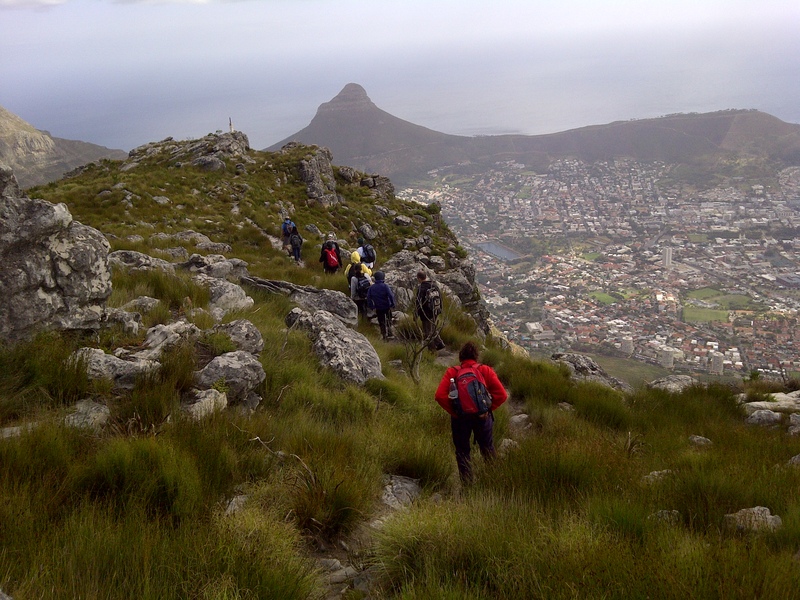 We climbed and scrambled through various cracks in the rocks and over and up sheer rocks as the path continued to rise steeply up, taking us to Mowbray Ridge. On our way up we came across the old and abandoned watch house which we had seen from below. 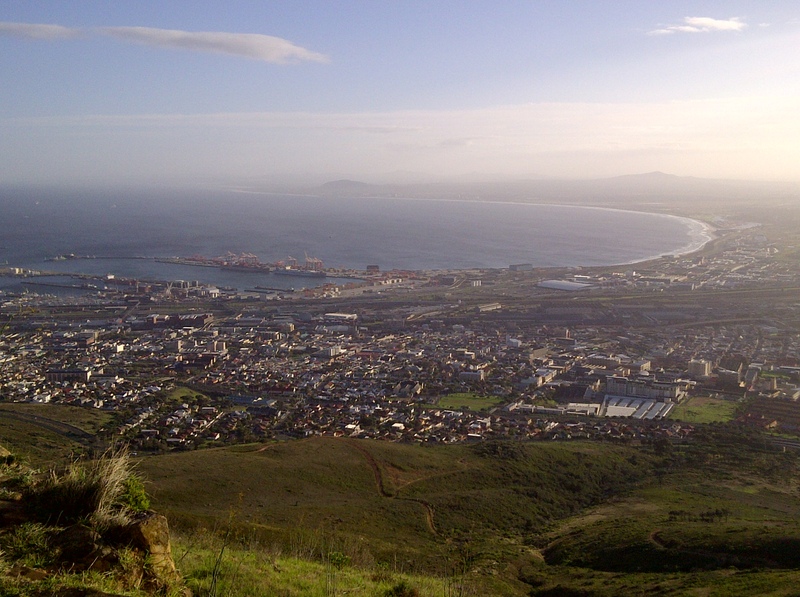 We were awarded with the most stunning views of both Table Bay and False Bay. The wind was pretty wild up here and cold so we found a nice sunny spot by the watch house and stopped for a nice snack while taking in the magnificent views below us. Admiring the views from the old, abandoned watch house. 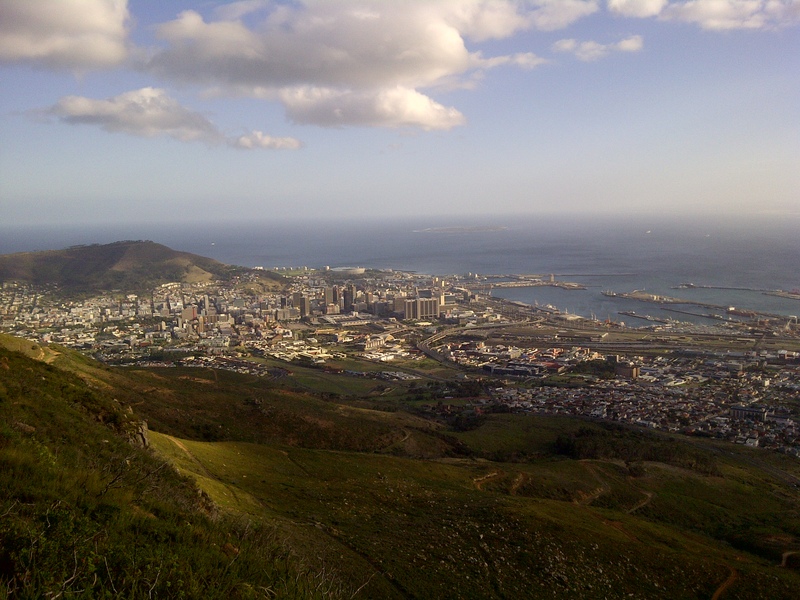 The view of the city centre below and the harbour, stretching all the way down the West Coast. Lowering ourselves down to cross over Knife Edge. Good sign people were still smiling! 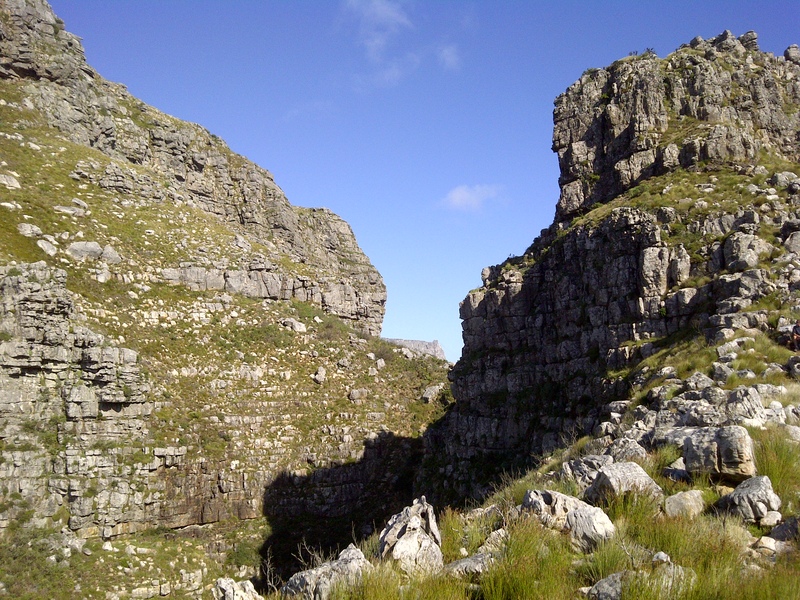 At the top, the ridge narrows alarmingly into the “Knife Edge” which, on its one side plunges (yes plunges) straight down into what they call the gaping First Waterfall Ravine with a steep drop off the other side too. When they say it’s not for the faint-hearted they certainly weren’t joking! Needless to say, in that howling wind, I stayed well back from the edge! We were walking, sorry correction, lowering our bodies down over rocks and scrambling over rocks with drop offs on both sides of us with a howling wind threatening to knock us off our feet if we were not paying attention or holding on! The adrenalin sure was rushing but it wasn’t over yet! Now this may intimidate those who are afraid of heights and at times looking down I counted my lucky stars I wasn’t afraid of heights and then quickly stopped focusing on the drop on either side of me due to the fact that I might suddenly develop a fear of heights and then, well I would be pretty screwed considering I would be stuck in the middle of this ridge that had no sides! At one point I stopped mid-ridge, making sure I had a good grip of the rock I was standing next so that I could turn around and tell Donna to stop talking so much and concentrate on what she was doing as I would hate a gust of wind to knock her off the ridge! Lol, you see Donna and Pierre were still in the thick of their conversation like this was a walk in the park! 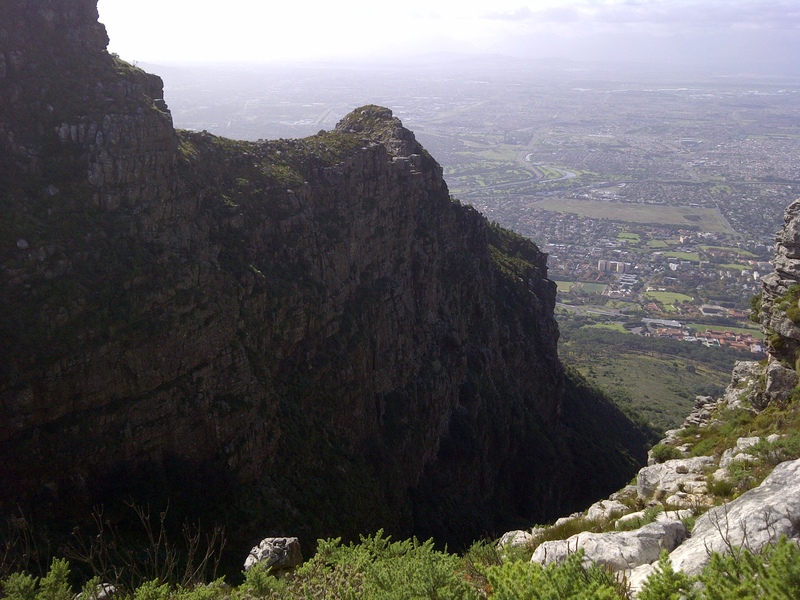 Despite the drops on each side of the ridge the views were out-of-this-world-spectacular. It was a pity the wind was so strong at that point as even though we were on a narrow ridge with no sides it would have been nice to linger a bit longer but the icy wind pushed us on. The drop down the right hand side of "Knife Edge". This photo really doesn't do it justice. In the howling wind I didn't have the guts to go over to the other side to take a pic of the sheer drop down the left hand side but keep reading, you'll get to see what it looked like on the other side! 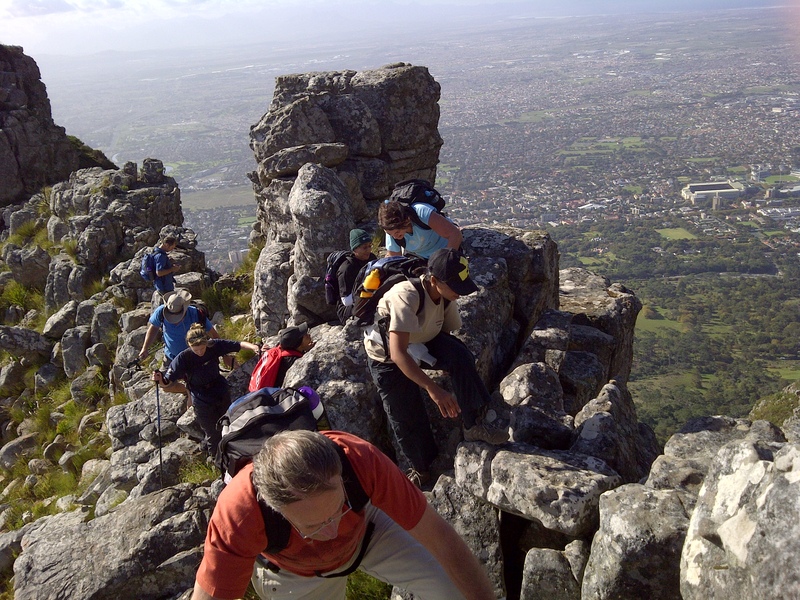 Everyone making their way across Knife Edge. 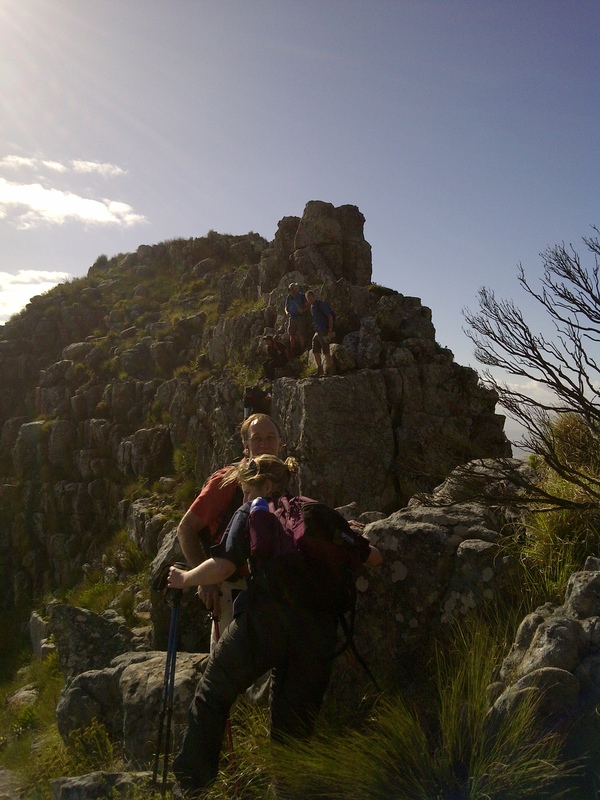 All safely across the ridge we headed up what is known as the minor summit of Devils Peak. To say the path was hugging the mountain would just be, plainly put, understated! 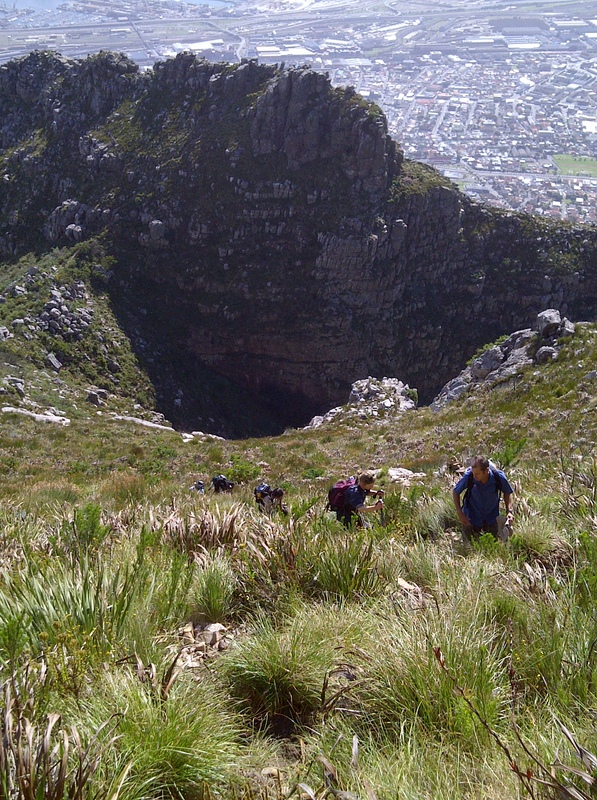 Having all made it across "Knife Edge" without being blown off, the plan now was to go up the what they call Minor Peak, round the side on a mountain hugging path and down and up Devils Peak on the left for the final ascent. 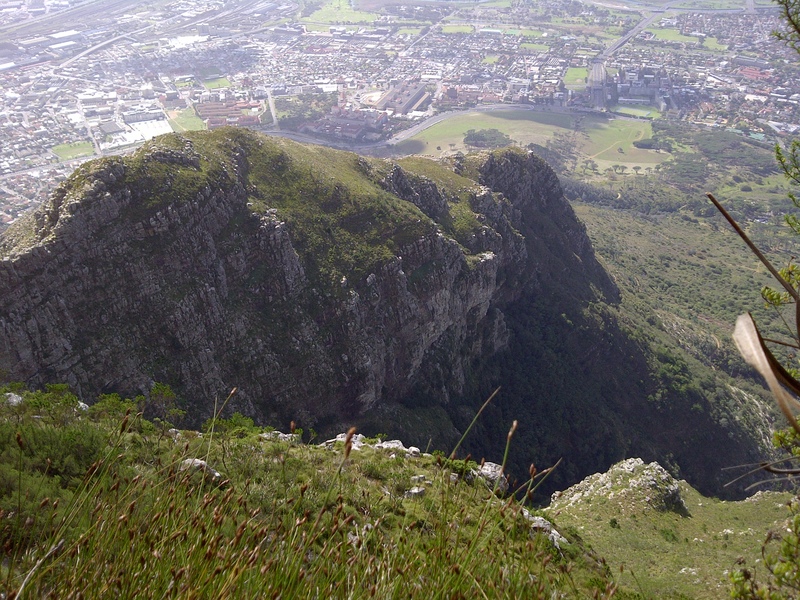 Once we moved over this section we were greeted with beautiful views of the city bowl below, Lions Head, Signal Hill and the cable way station at the top of Table Mountain. It was breath-taking! 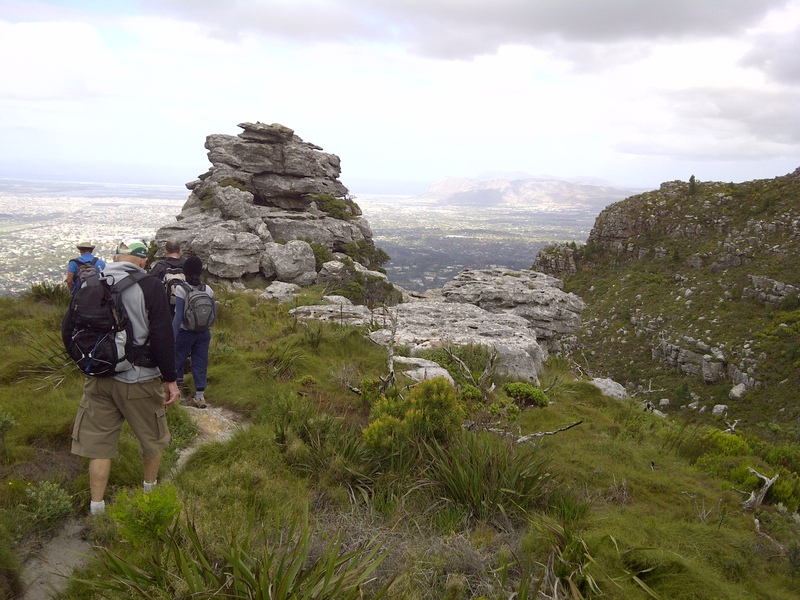 As we rounded the corner of Minor Peak we were greeted with the most beautiful views of Table Mountain and Lions Head. 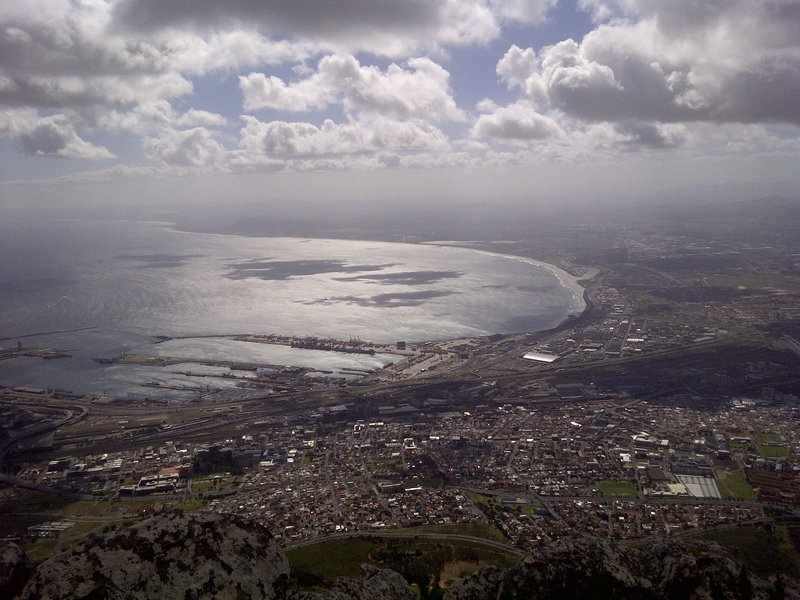 Awesome views of Lions Head on the left and Signal Hill, the Cape Town Stadium that was built for the World Cup Soccer and Robben Island on the upper right. 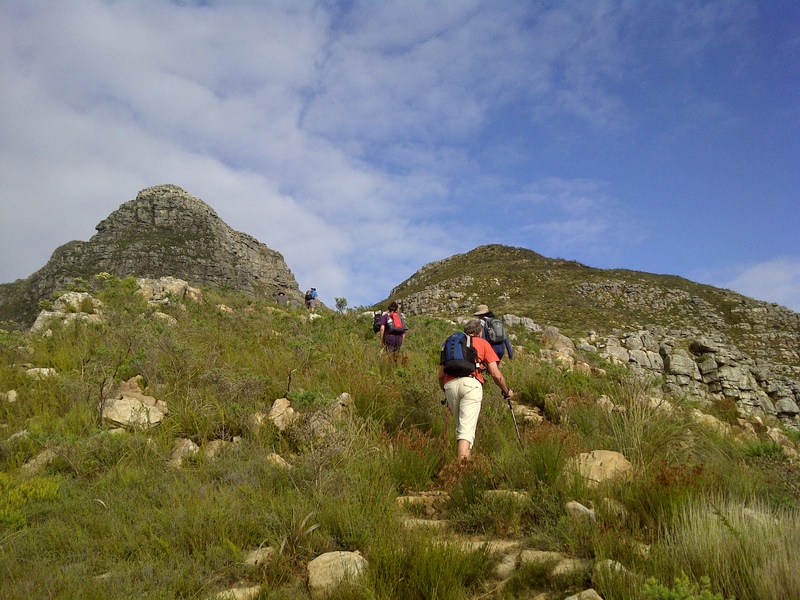 After taking a few more pics we descended to the saddle between the minor and major peaks of Devils Peak and started the slog up the dry, sandy and stony mountain side making our way up and around Devils Peak, it was the last push to the summit. It was while on this side we got the pleasure of looking back at what we had just hiked over; looking down into the astounding ravine and along the crest of the Mowbray Ridge we all felt a very real sense of achievement, for there across the way was the hair-raising mountain plunging far below where our eyes could see. Thomas was surely testing our limits and we were all grateful we would not be going back the same way we had just come! Now remember when on "Knife Edge" I said I wasn't going to venture to the left hand side edge in that wind to take a photo of the drop down that side. This is why. This is standing on the opposite side looking back on what we had just crossed.... note the sheer drop!! Taking in the view of what we had just crossed over on the other side. It was a pretty unbelievable sight and I think we all felt a great sense of achievement standing there looking back! The rest of the group making their way up to where we waited. 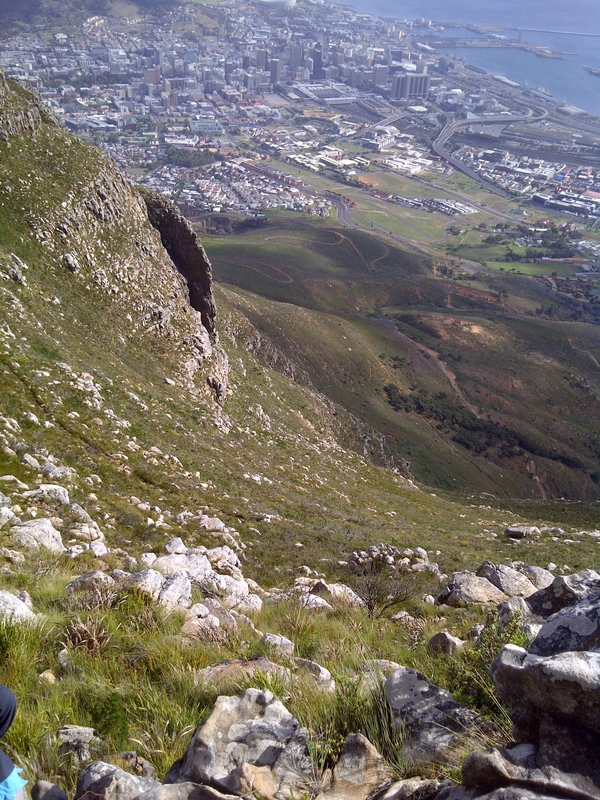 If you take a look to the very left of this photo (round mid-way) that is Knife Edge and what we crossed in howling wind. Now do you see why you had to hold on!! But that is not where our adventures ended; this is where things started getting really interesting! After feeling very proud of ourselves for what we had made it over, we continued up and around, the path finally levelled off but started to narrow yet again onto a bushy shelf that got less vegetated as it continued across the face and before we knew the next section was too narrow to walk straight across and we had to climb up (actually more like find a tiny place for your fingers to grab a flat wall of rock and be pulled up by someone on top and pushed by behind if your hiking boot couldn’t find a foothold!) then you had to turn into the rock, and hold onto the rock as we crabbed our way across! I was in the front section of the group who made it across this section and we all found a spot at the top to sit and wait for the others to make it over. You could hear them coming and then asking “How did you get up there?” After some explaining and some of the men helping the girls up and across, we would shout out “are you ok over there?” or “how’s it going?” the reply that came back to us over the rocks would be “Don’t ask me that now!” Lol, there was lots of laughter; anything at that point would help lighten the tension! 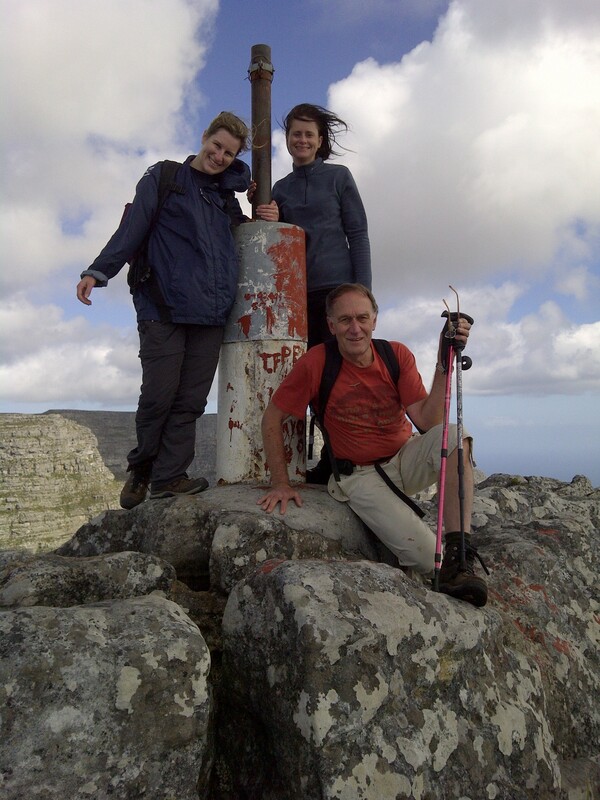 Once we were all through and over we made the final trek up to the summit of Devils Peak. 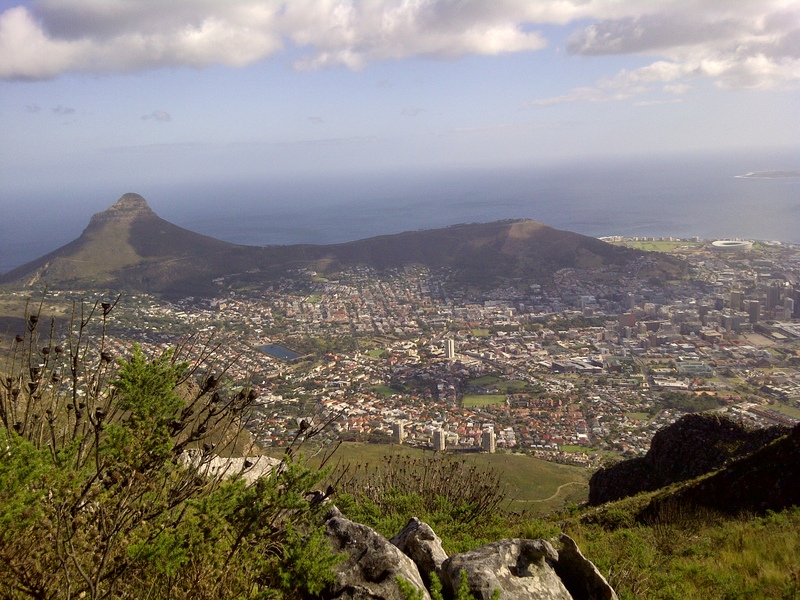 A few more scrambles and suddenly we emerged at the top with the most beautiful views greeting us from all around, views of Table Mountain, the City Bowl and Table Bay and beautiful views extending right around and across the Southern Suburbs. 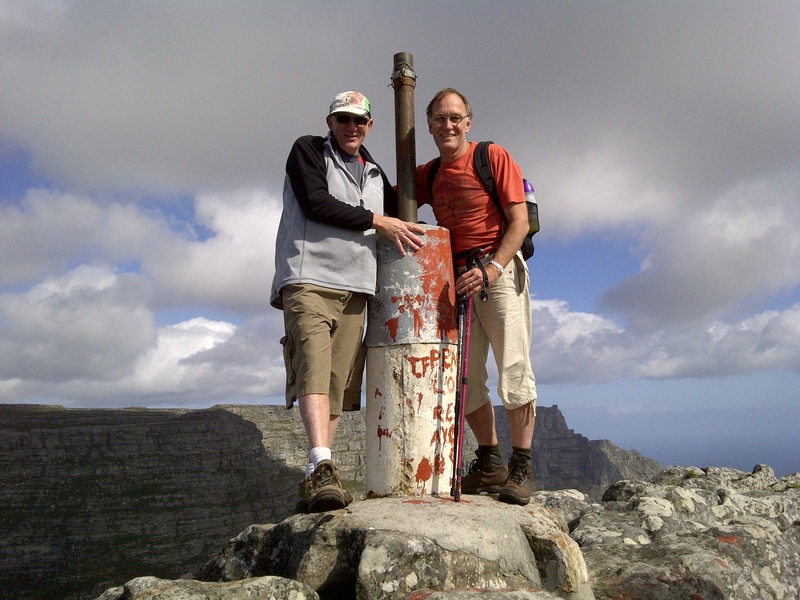 David and Pierre(FM) on top of Devils Peak with Table Mountain in the background. If I recall correctly it was the first time they had been up there. 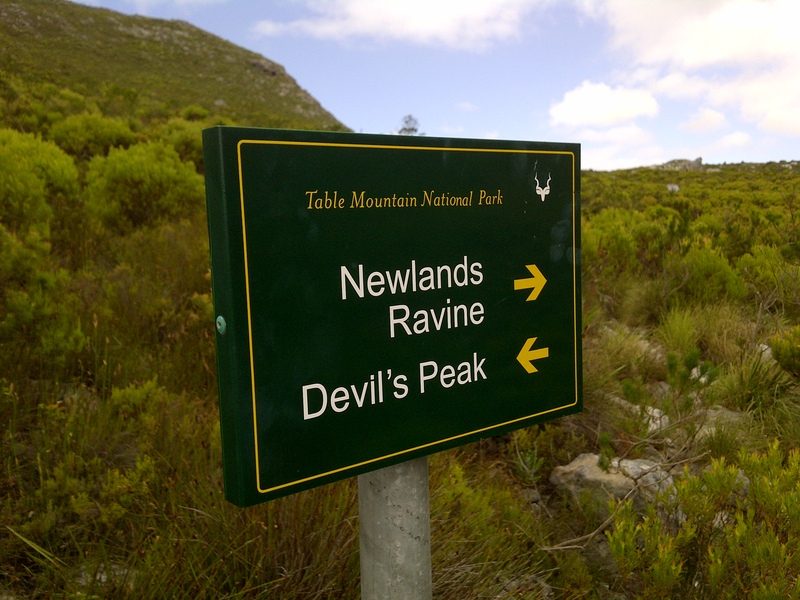 After enjoying a nice lunch and regaling our tales of our morning journey up the mountain we started to head back down with our chosen route back down Newlands Ravine. After a good lunch break, it was time to make our way back down again. The wind by now was even stronger and icy, icy cold and we all had jackets of some sort on. 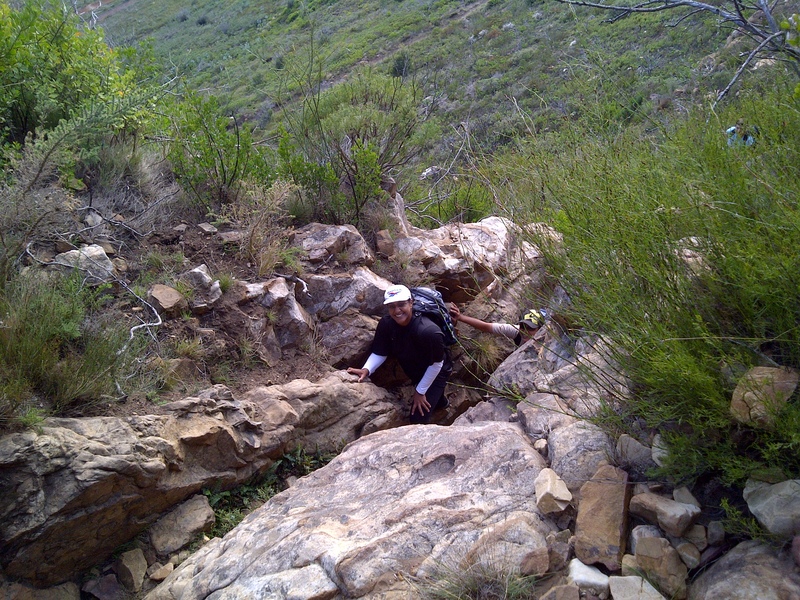 Reaching Newlands Ravine, which from the edge looks like another steep drop down, was not meant to be. Thomas leading our group, went down first only to call back up saying the path had been washed away and it was unsafe to descend via this route. In the end, after not being able to find a suitable route down that side of the mountain, we had to back-track again and decided to take the long route around the front of the mountain, which again extended us with the most amazing views yet again, and for me it was a trail I hadn’t walked before and it was beautiful to see it from this side of the mountain. 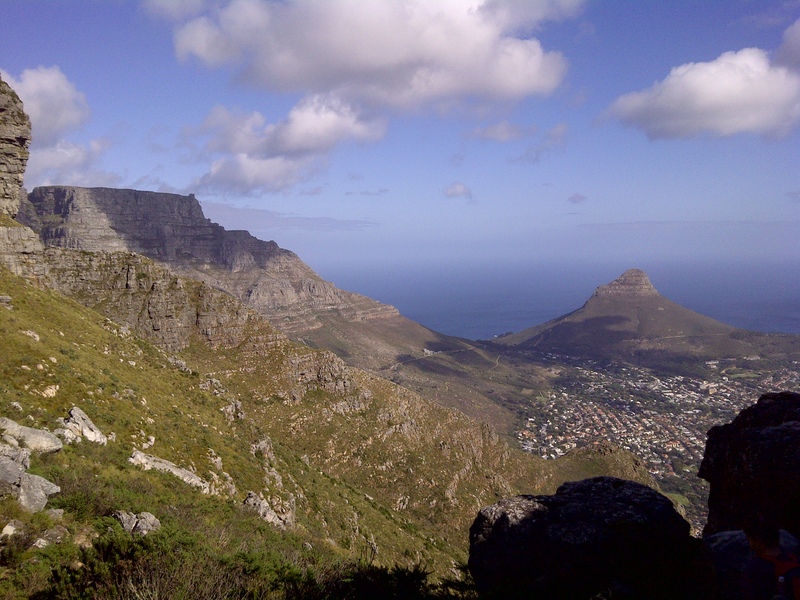 Reaching Tafelberg Road we had a comfortable, flat scenic walk back to our starting point at Rhodes Memorial. Ready to descend after a great day on the mountain full of adrenalin, laughter and amazing memories ~ I won't be forgetting this one for a long time to come! 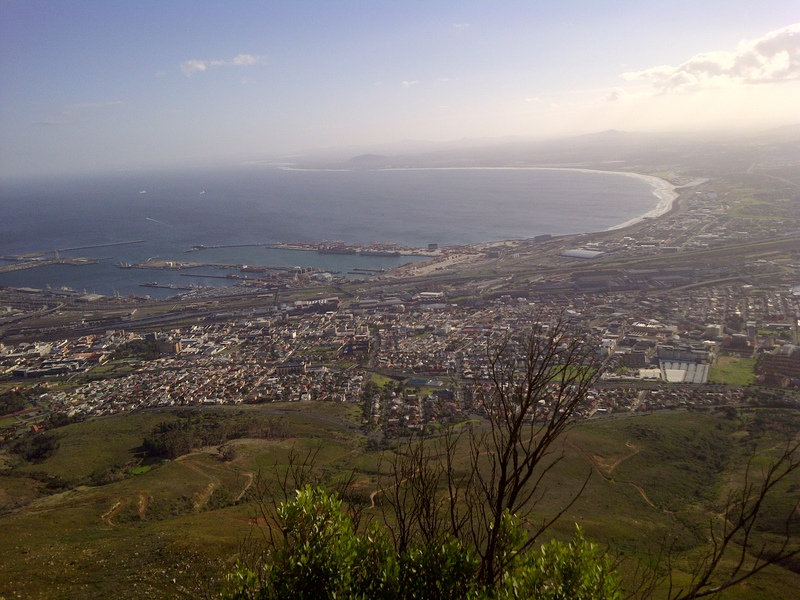 An amazing 7 ½ hours spent on the mountain, definitely a hike I will not forget easily. Another day closer to Kilimanjaro, I’m loving every minute of this training even if it means before crack-of-dawn early mornings! 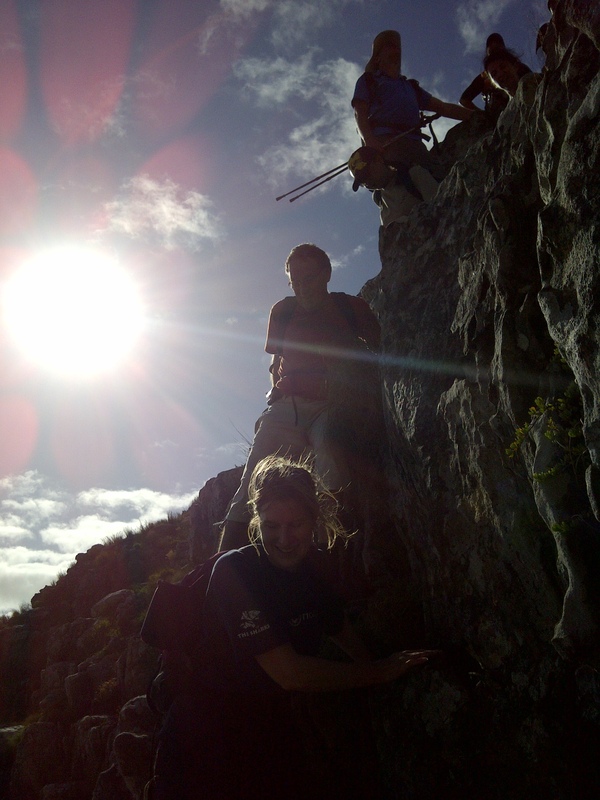 Another amazing hike to add to the pile, thanks Thomas for guiding us safely up this challenging route! Previous Never Give Up! Next Behold the Power of Dance!